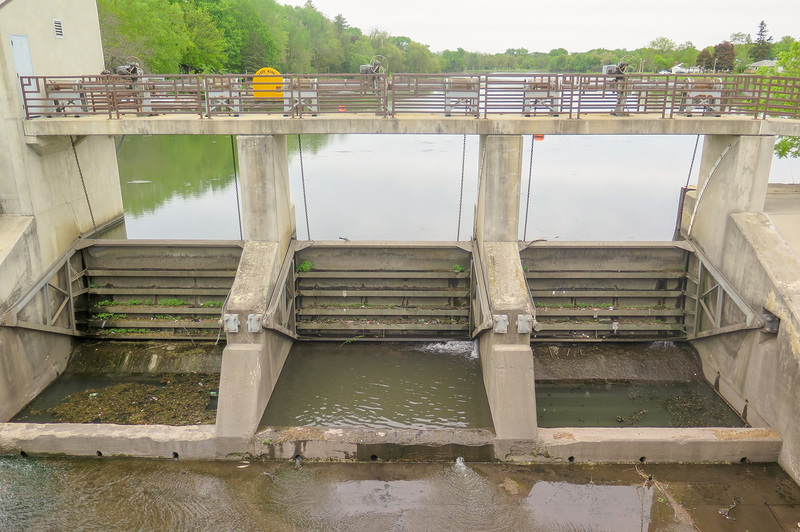 Typically, a radial gate has two pick points, one on each side, that are used to open and close the gate to control water flow through the dam. Steel cables or chains are attached to each pick point, and an actuator, such as a hoist, is used to raise the gate. The gate pivots around a trunnion and water can then pass underneath. Radial gates are often large, and if the hoist is off center, or the lines are not tensioned properly they will distort as they are raised. This causes wear and tear on side seals, damage to the concrete walls in the bay, and eventually the gate itself will have permanent deformation. Tensioning the steel cables or chains is not difficult, and will increase the lifespan and functionality of the gate. This extra step can save a lot of money in the long run! Many of the gates we have rehabbed or replaced over the years were tensioned using eyesight. If it looked level, then both sides must have the same tension, and that was good enough. This can be deceiving because eyesight is not the best tool to measure tension. Eventually damage will be found along the edges of the gate or in the radial arms as time goes on. As a general rule of thumb, the tension on each line needs to be within 5 percent of each other when there is only one steel cable or chain attached to the pick point. On larger gates where there may be two or more tension lines on each side of the gate, each cable has to be within 2 percent of the one next to it, and side to side comparisons need to be within 5 percent. If your tension is off too much on one side, the gate will begin to distort when it is picked. There are multiple tools available for testing tension, however the three we typically use are strain gauges, tension meters, and for quick jobs we use come-along ratchets. A strain gauge works by converting the tension, or force, present in the lines into a change in electrical resistance, which can subsequently be measured. This method works for both chains and cables, as long as there is a place on which to weld the strain gauges. As the gate is lifted and the cables or chains are put into tension, the strain gauge is also put in tension. The electrical resistance will vary depending on the amount of tension detected. The goal is to make adjustments so that the measured tension on each side is within 5% of one another. 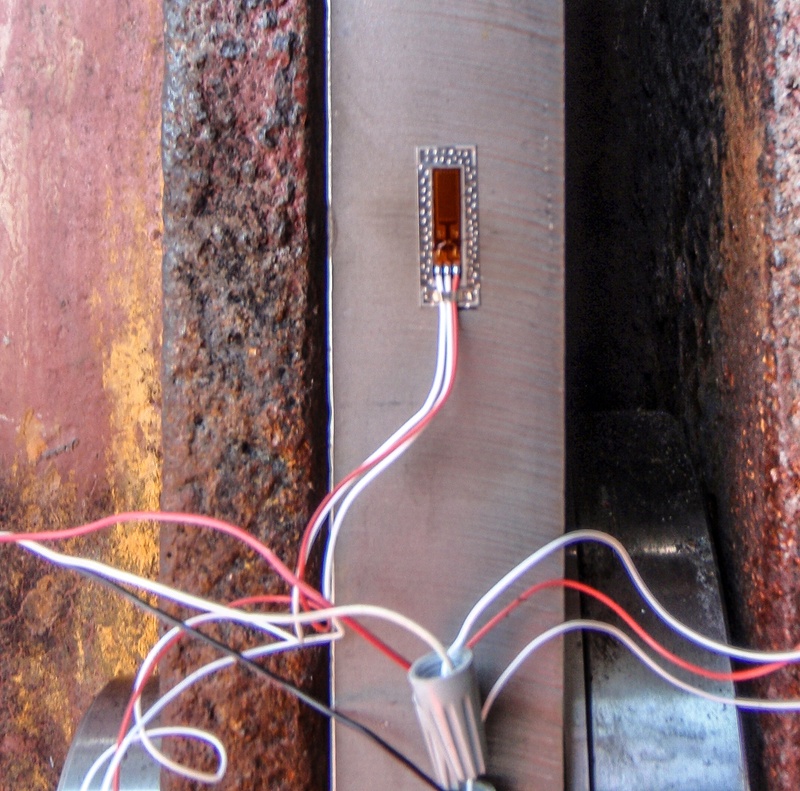 Strain gauges can be the most costly option to measure the tension, but they are also the most accurate one. Tension meters only work if the gate hoists are cables, they will not work on chains. The meter is a handheld device that attaches to the cable and a load cell measures the tension. A tension meter is a quick way to get an accurate reading without a lengthy set-up process that includes welding. Some of our clients want a quick and dirty way to achieve equal tension without the use of strain gauges of meters. Here one can simply use a come-along, a hand-winch with a ratchet and hooks on either end. When relying on a visual inspection, this will help with accuracy. The come-along attaches to both gate hoist lines on each side of the radial gate. As the come-along is ratcheted down, it will apply an equal amount of force perpendicular to the line of action. You then look to see if either of the lines is bending more than the other. If it does, then the tension needs to be adjusted on that particular side. 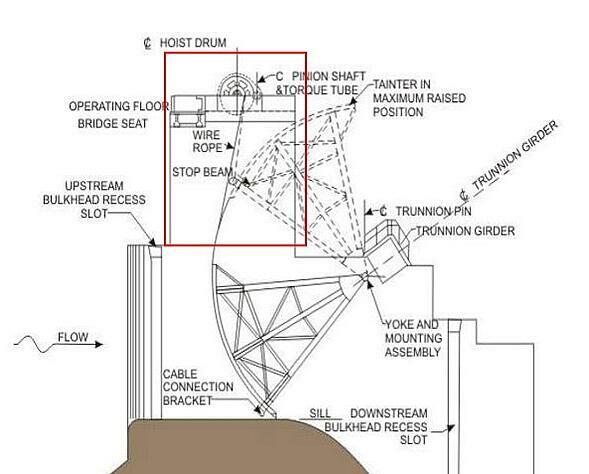 Ideally, the bend in the hoist lines should be equal when they are equally tensioned. Unlike the strain gauges and tension meters, the come-along will not give you a converted measurement of the tension. This is the reason that using a come-along is typically the least expensive of the tension testing methods. and is often used for a periodic check rather than on a new installation. It is important to have the means adjust the tension built in, whether it be at the connection point where the line attaches to the gate or in the machinery. 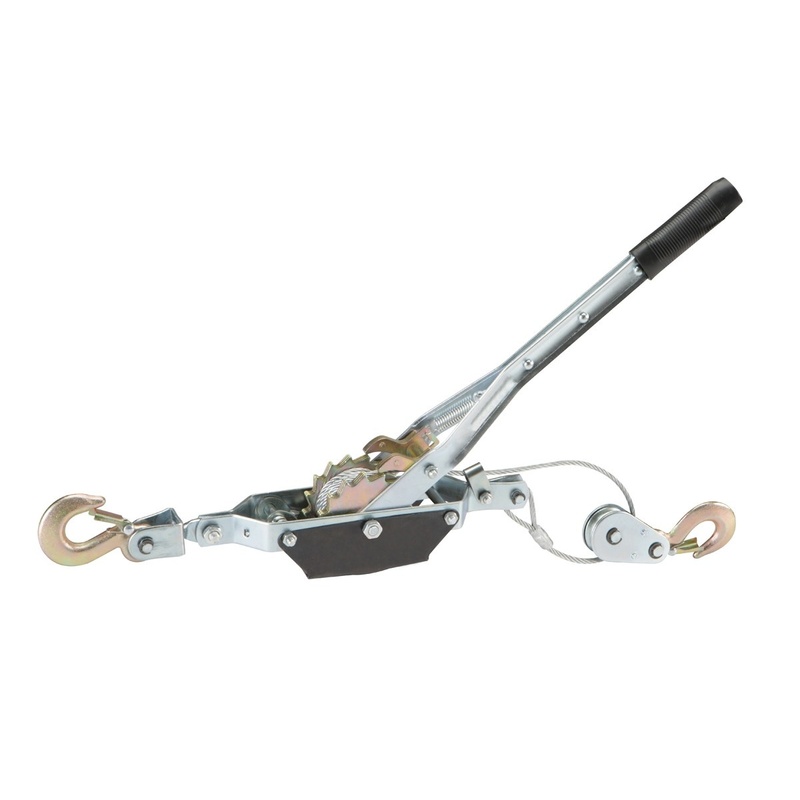 Means to adjusting the tension in the chains include a turnbuckle, link bar, or in the hoist itself. Adjusting the tension is not as straight forward as one may think. Different line-types have different challenges. For instance, if the line is a cable, then it can stretch. Chains on the other hand, are rarely the same length. When a manufacturer makes a chain, each link has a tolerance. When the links are put together, the tolerances can add up causing length variations. For instance, two 20-foot chains are unlikely to be the same length because of the cumulative tolerances in the links. Keep in mind that there may be more or less chain than realized that needs adjustment. Tension is a facet to keep an eye on in the future, and it is a good idea to ensure you do routine checks on your gate hoist lines. Anytime you disconnect and reconnect gate hoists lines you should check their tension. Periodic checks are also recommended because cables can stretch and the gates can warp. This can lead to damage on the side seals and adjacent concrete in the gate bays. Tensioning gate hoist lines properly can be a step that is often overlooked, but it is critical to maximizing the lifespan of a gate. Ensuring that your hoist lines stay appropriately tensioned is a proven process to preventing unnecessary damage to your structure and increasing the longevity of the radial gate.